Why quality matters for museum model boats. Quality craftsmanship is essential for a quality model, but it's not enough. The final result also depends on high quality research and planning, as John Into and Nancy Price point out in their book, "Fundamentals of Model Boat Building." Quality always matters, but this is especially true for museum work. Museum patrons expect authenticity, so that is a primary expectation for museum acquisition decisions, too. Curators look for quality in all three steps - research, planning and construction - and only then do they consider price and reliable on-time delivery. The same is true for any client that places high value on model quality. Let's use boat models to illustrate the point. Research is the first step and it often requires one-third or more of the total time to build a quality model. In many cases, the museum and the exhibit designer do not have detailed information on every element in their display and it is up to the model builder to ensure authenticity. Research like this is a particular strength for Model Builders, Inc. Often we have discovered original specifications unknown to museum personnel. Research can be quite challenging. You may or may not be able to find a kit or detailed plans for the boat you are going to build. One difficulty is that if the boat model is a US Navy ship that is currently commissioned the policy of the US Navy is to not release any of the drawings. For ancient boats little information may exist. You may have to work from a sketch or artist's illustration Unless you are willing to put in the hours necessary to search like an archeologist for as much relevant information on the boat as you can possibly find you probably won't be able to build a accurate boat model. If however you do the necessary research you often can find plans, pictures drawings and other information needed to build a quality model. Once in a while the real boat exists and you can do some research by going to see it. There are a wide variety of sources for detailed plans, photographs, books, illustrations, magazine articles and other information on boats. The Hart Nautical Collection at MIT, the Mystic Seaport museum, the Smithsonian, the US Naval Academy museum, the Wisconsin Maritime Museum at Manitowoc and many other museums have real ships, scale model ships and boat plans. The Nautical Research Journal is an excellent magazine and starting in 2013 they are greatly expanding their coverage of model boat building. I know of one model boat builder that builds limited edition boat models for collectors. He will only build that boat model edition if he has access to the original drawings of that boat. However working from all of the original drawings is a very time consuming and unless you can spread the cost over a limited edition (or a large production run for commercial kits) then the cost to build one boat for a museum might be too high for their budget. Many of the museums we have built boats for are looking for the highest quality model they can afford. Research results normally shape the planning for the boat construction. If you have found detailed plans for the boat or a detailed kit model of the boat that will help minimize the planning time that would been taken up with creating scaled drawings based only on whatever other information you found. You may have to design special jigs to accurately portray plank on plank construction. The Curator of the Navy checks the symmetry of the two sides of the hull to see if one side varies from the other. You may need to get or make special tools or jigs to keep both sides symmetrical. It takes a while to track down the expert boat modelers and historians for the specific boat you are building. Often they can be a very good source to find the right methods and steps to fabricate your boat. The Nauticaul Reseach Guild holds an annual meeting where you can meet some of the best boat modelers and historians. There are also many model boat building clubs around the country such as the Midwest Model Shipwrights which meets monthly. Several of their members have received awards in national model boat building contests. Let's take a look at some of the boats models that we built for the Ft. Osage Museum in Sibley, Missouri. Above are seven very different boat models. A variety of source information was used to build these boats - from kits to plans to just illustrations. The tugboat, LCT boat and Keel boat were built primarily from kits of varying quality. The keel boat kit we bought wasn't detailed enough so we studied photographs and illustrations to determine how to upgrade the model to a higher level of detail and more realistic looking materials. For the flatboat there were no plans or kits. We studied illustrations, found the basic dimensions in literature and consulted with the museum. Collaboration among the model builder, the exhibit designer and the museum often results in a high quality at a reasonable price. This flatboat model is not made out of wood. It is made out of ABS plastic that was painted to look exactly like wood by a very artistic model builder. It will last much longer than wood construction. 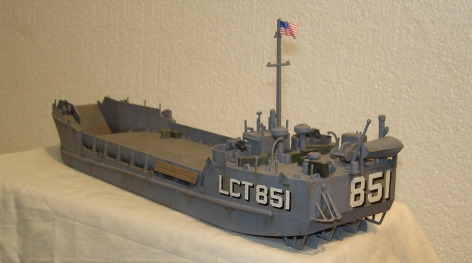 This World War II LCT (landing craft boat) is built from a plastic kit. However the model builder is also an artist who weathered the boat to look highly realistic. This Dugout canoe model is based on photographs and illustrations. It is hand carved out of wood and artistically painted. 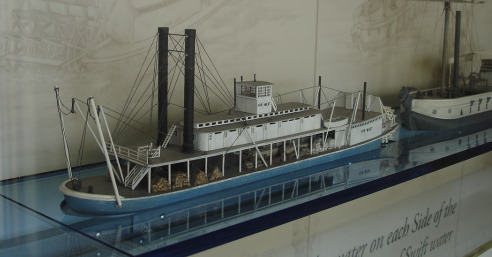 The Far West paddleboat model was built from plans and embellished with detailed loads on the lower deck. The paint was modeled to give the Far West a realistic aged look. 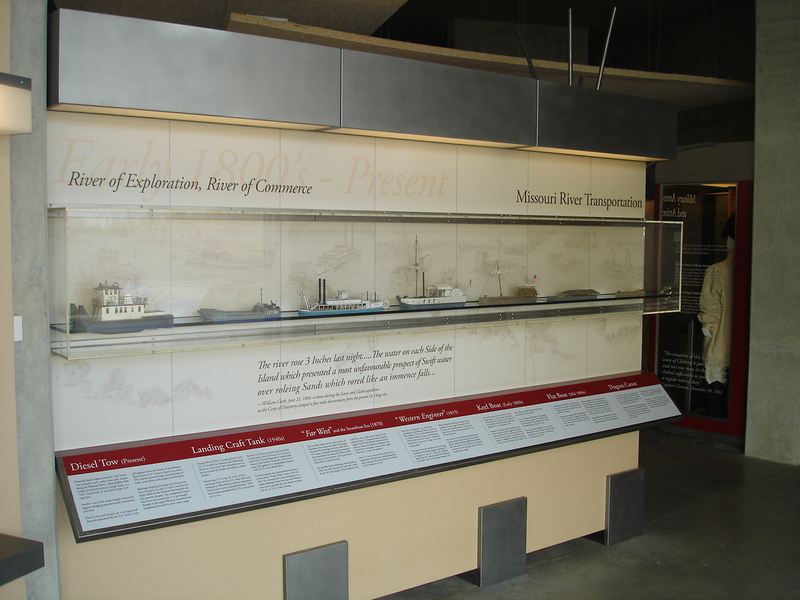 Most often museums are looking for boats that fit into into a specific exhibit such as one about the Missouri River. The boat model usually has to be at a specific scale for that exhibit. Consequently the boat model is custom built by a professional model builder. A high level of craftsmanship, realistic painting and researched details gives these boat models a quality that meets museum requirements and engages the viewer. If you have any questions or would like to discuss boat models or other projects contact us at Model Builders, Inc. 773-586-6500 or info@modelbuilders.net .